Flame-Resistant, Waterproof, Breathable Outerwear from the makers of GORE-TEX® products. GORE® FR Apparel products offer an ideal balance of protection, comfort, and durability for oil & gas workers in physically demanding and extreme environmental conditions. 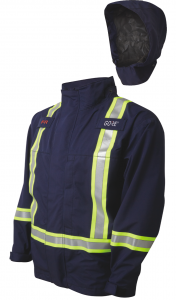 Made with GORE-TEX® PYRAD® fabric, this waterproof, windproof, breathable line of products provide an optimum combination of protection against flash fire, petroleum, oil-based hazards, and hot liquids/steam without sacrificing comfort in a lightweight, low bulk form.